U.S. Republican Senator John McCain said on Sunday he would subpoena 10 U.S. sailors to testify about their brief detention by Iran if the Obama administration does not provide the findings of an investigation into the incident by March 1. "It's an option that I do not want to exercise," McCain, who chairs the Senate Armed Services Committee, told reporters as he was returning to the United States from an international security conference in Germany. McCain said he had been told the sailors were still being debriefed, but added that he assumed that administration members were "dragging their feet" in completing an investigation into the incident, which he accused Iran of exploiting for propaganda purposes. "I guarantee you, if they don't have a debrief by the first of March like they said, we'll have a hearing and we'll subpoena. We're not going to wait any longer," McCain said. "We will subpoena the individuals if we have to." U.S. sailors were taken captive in January by the Iranian Revolutionary Guard for reportedly straying into Iranian controlled waters after a mechanical problem. 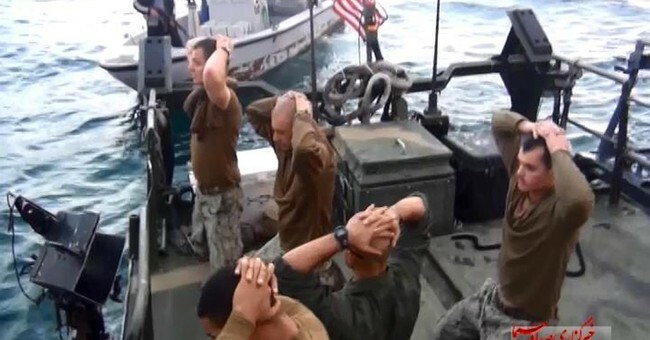 The sailors were held at gun point, forced to sit on their knees, stripped of their boots and forced to make an apology on video, which was then used as propaganda by the Iranians and sent out on state television. The use of photos or video taken of war prisoners for propaganda purposes is a violation of the Geneva Convention. After being stripped of her boots, the sole female soldier was forced to cover her head. When the sailors were released after being held for 24 hours, the Obama administration, and Secretary of State John Kerry in particular, argued the situation was a diplomatic victory. Senate Republicans and many military leaders strongly disagree. After the incident occurred, many questioned how the Revolutionary Guard was able to take U.S. sailors hostage in the first place. The report McCain is waiting on certainly could shed some light on what the new rules of engagement are with Iran now that the U.S. has a nuclear deal signed and as the Iranians bring in billions of dollars in new business from Europe.